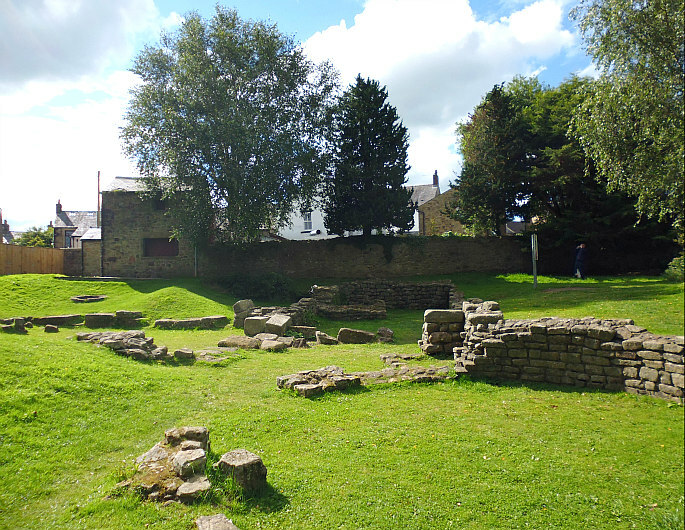 Roman bath-house at Ribchester, Lancashire. OS Grid Reference: SD 65090 35206. 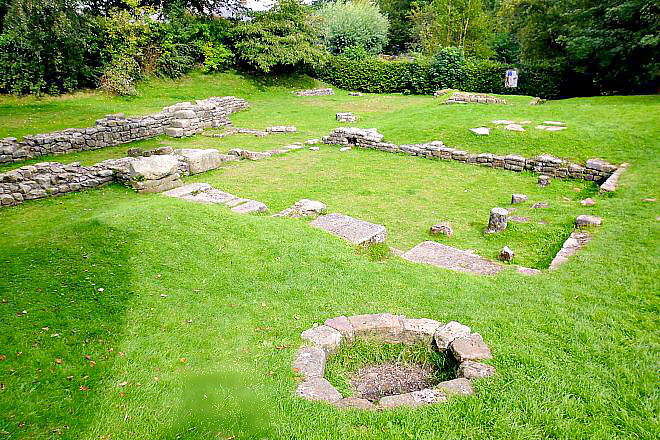 In the village of Ribchester, Lancashire, are the excavated foundations of Roman bath-houses, dating from around 100 AD, though there may have been an earlier Flavian structure here. The ruins are to be found in a secluded area at the back of the White Bull Inn and Water Street – at the north-western side of the River Ribble, and in an area of the village that is called Greenside. It would seem that the bath-house only survived for a few hundred years, if that, being built outside of the Roman fort of (BREMETENNACVM’s) ramparts. Excavations took place in 1978. The foundations of the bath-house are now well-looked after, with green lawns in between, and excellent information boards to boot! The White Bull Inn has four Doric or Tuscan columns supporting its front porch – two of which could have come from the bath-house, the fort or a temple? In the village from Church Street (south-side) follow the footpath (east) beside the river, and then northwest through the wooded area to the bath-house site. 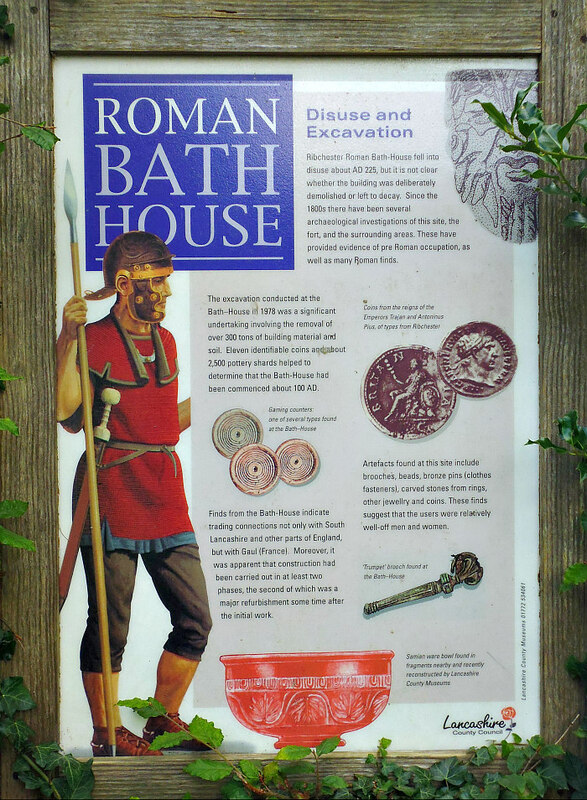 John & Phillip Dixon (1993) give some good information regarding the bath-house remains. 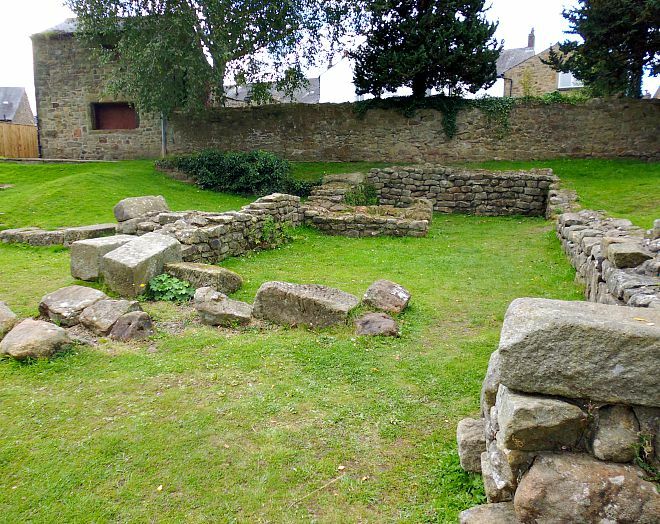 They tell that: “Another Roman feature to be viewed is the excavated Bath House, located at the rear of the White Bull. Recently erected explanation boards help one to pick out the outline of the bath house amid the crumbling piles of stones (the excavation was a costly disaster and much damage was done to floor tiles, walling etc.). Roman Bath House foundations and Well. Jessica Lofthouse, writing in 1974, has nice things to say about Ribchester: “I like it for what it is, an honest to goodness community without any frills or attempt to exploit its undoubtedly rich past. No Ye Olde Praetorium Guest Home, or Minerva Café, or Agricola Gift Shoppe about Ribchester, but it has a good, compact Museum of Roman Antiquities, an hour in which is most rewarding. The Information board at the bath-house. Dixon, John & Phillip, Journeys Through Brigantia — Volume Nine — The Ribble Valley, Aussteiger Publications, Barnoldswick, 1993. Lofthouse, Jessica, Lancashire Countrygoer, Robert Hale And Company, London, 1974. Peace, Richard, Lancashire Curiosities, The Dovecote Press Ltd., Stanbridge, Wimborne, Dorset, 1997. Shotter, D. C. A., Romans in Lancashire, The Dalesman Publishing Company Ltd., Clapham, Lancashire, 1973. 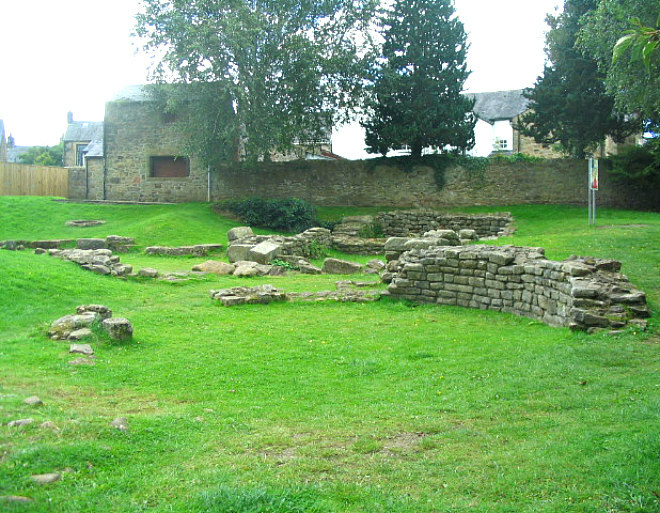 Categories: Roman Sites | Tags: Roman Bath House at Ribchester in Lancashire | Permalink. Ribchester is one of my favourite Roman Sites. Mention should also be made of the remains of the Granaries near to St Wilfred’s Church. Ask for directions at the Museum. The museum is run by The Ribchester Museum Trust and is open October to March, Monday to Friday 10.00 to 17.00 and Saturday 12- 16.00. From April to September it is open Monday to Friday 10-17.00 and Saturday and Sunday 12-17.00. Entrance is £4 adults, £ 3.50 pensioners, and £2.50 for children over 5. Children 5 and under get in free. Well worth a visit. Postcode PR3 3XS The Museum located close to the church. Bathhouses were invariably located outside the fort because of fire risk.